Auto Digitizing's Sew Easy with PE-DESIGN® PLUS is NOW available for pre-ordering. 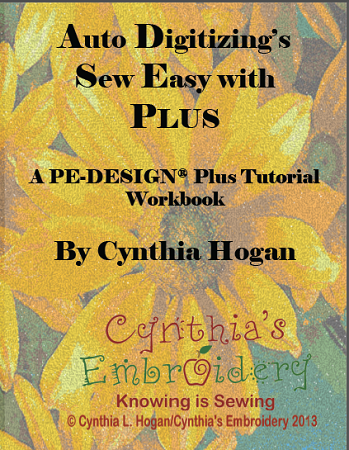 The latest in Cynthia's PE-DESIGN® tutorials is a must have for those wanting to learn their PE-DESIGN® PLUS software the "Easy" way. The Softbound book with 341 PRINTED pages is filled with step by step instructions with screen shots to guide you through learning all about your PE-DESIGN® PLUS software (not just Photo Stitch™). Cindy has even found a way for you to use TT fonts with your software. Included in the workbook are 3 BONUS video lessons on the accompanying CD.